A couple of weeks back, Simogo started teasing about their forthcoming project on their website. It wasn’t the nice kind of teasing either, it was the mean kind: the kind that makes you use your brain. As anybody who knows me can tell you, using my brain isn’t my strongest quality. However, from that cryptic post we’re able to deduce a few things. The project has been in full production for just over a month by now. It uses a new control method. It has to do with anthropology in some way, and it’s not level-based nor is it endless. Also, pictured in that post is a book called “En gång i Sverige" which translates to “Once in Sweden". The book contrasts the modern Sweden with that of its rural roots, and examines the differences in lifestyles in both. Intrigued yet? 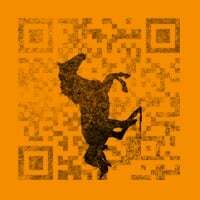 Well, today Simogo has posted another brain scratcher, this time in the form of an animated gif that slowly fades into a picture of a horse that then morphs into a QR code. The post title is “Hoof Key". A quick scan of the QR code using my ultra-hightech detective equipment lead me to this link. Yeah, that’s… a picture of a horse. The title of the picture roughly translates to “Nøkken as a normal white horse". Nøkken, or Nix, is the mythical musically gifted water spirit who has been a part of European lore for centuries. So what is the deal here? I’m enjoying the possibility of where these vague clues might lead, but it feels like there’s something more hidden deep within. That’s where you come in, dear reader. Figure this thing out for me so I can finally sleep at night. Feel free to get the brain juices going in the comments below, and let’s try to blow the doors wide open on Simogo’s dastardly escapades.